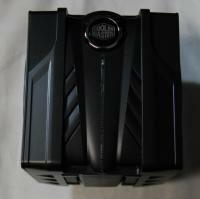 Today we've got a new cooler from Cooler Master on the test bench here at BCCHardware, the new V6 GT CPU Cooler. This cooler has an "automotive" design and features a "oil cap" button on the top to control the built in customizable LED lights on the top of the cooler. Overall this cooler has a bit more of an aggressive look yet isn't over the top like some others. 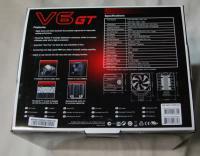 The V6 GT cooler features 2 120mm fans (one on each side) so performance should be decent thanks to the more than adequate amount of airflow. Let's see what the Cooler Master V6 GT is all about in the next section. 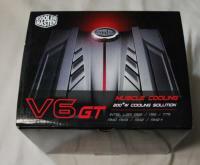 Much like the V8 and V10 coolers the V6 GT has a "automobile/engine" design to it. The big button on the top of the V6 GT lets you turn on the built in LED on the top as well as toggle between 3 different colors (purple, red and blue). 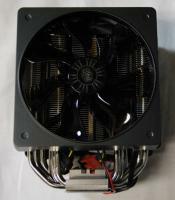 The V6 GT features 2 120mm fans that can run anywhere from 800-2200 RPM and are controlled by PWM. 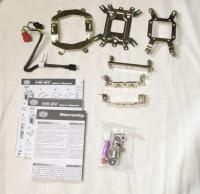 Alternatively you could plug the fans into a fan controller if you prefer to control these fans manually. 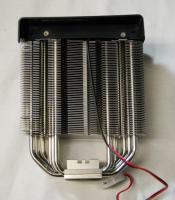 The V6 GT is a "heatpipe tower" cooler (which is a very popular design). 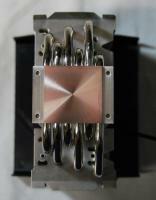 This cooler has aluminum fins and a copper base and features 6 heatpipes (as you can see in the pictures below). As you can see in the next set of pictures (right) both of the 20mm fans are removable (and you will have to remove them to install this cooler). 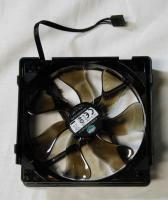 Both of the 120mm fans snap off easily and don't require any tools to get them on or off. With the V6 GT you get everything you need to install this cooler on pretty much any CPU currently available (including the new 1155 Sandy Bridge CPU from Intel). 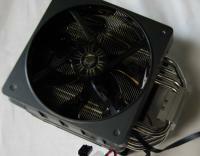 Cooler Master has also included a Y-Adapter so you can plug both fans into one fan header if you wish. That's pretty much everything when it comes to the Cooler Master V6 GT. In the next section we'll install this cooler and see how it stacks up against other coolers.